More than ever an instrument clearly cut out for competition, the new Mille Miglia GMT Chrono 2012 ensures exceptional readability thanks to its oversized counters. Its mechanical self-winding movement chronometer-certified by the COSC also provide an extremely practical dual time-time function. 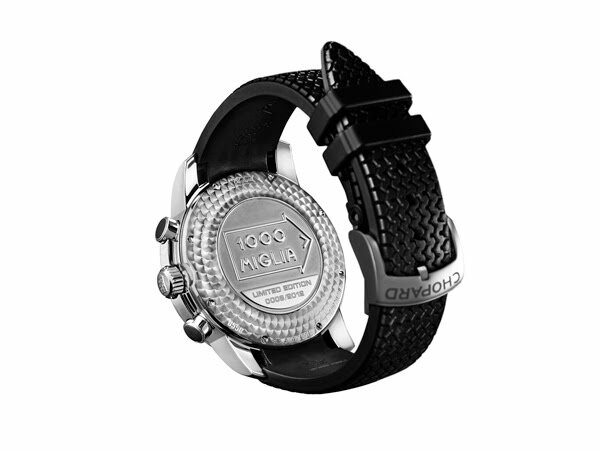 This sporty and sophisticated watch is issued in two limited editions of 2,012 in steel, and 250 in rose gold. 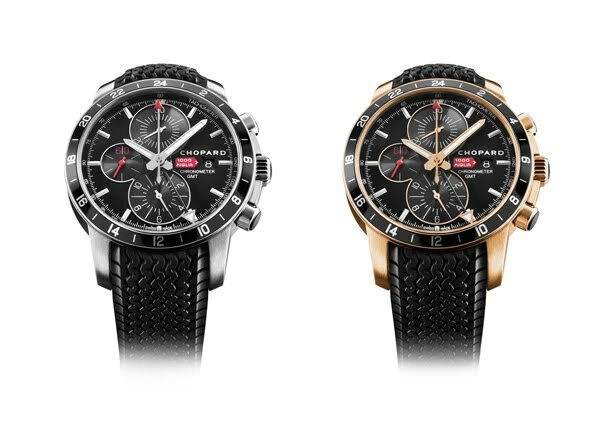 Consistently reinvented perfection: that is exactly what Chopard is determined to offer in annually unveiling new limited editions of its Mille Miglia collection. This prestigious historical car competition, acknowledged by connoisseurs as “la corsa più bella del mondo” (the most beautiful race in the world) continues to inspire what has become a watchmaking classic. At once sporty and elegant, the new Mille Miglia GMT Chronograph is now enriching the Chopard Classic Racing line that encompasses all watches paying tribute to the automobile world. An instrument that will more than ever prove an indispensable companion for all devotees of fine mechanisms. The Mille Miglia covers a 1,000-mile (1,600 km) stretch from Brescia to Rome and back. Formerly a speed trial (1927-57), it is now the worldwide rendezvous for connoisseurs of collector’s cars. Each year in May, several hundred aficionados come to take part for three days in this legendary event with which Chopard has been associated since 1988. 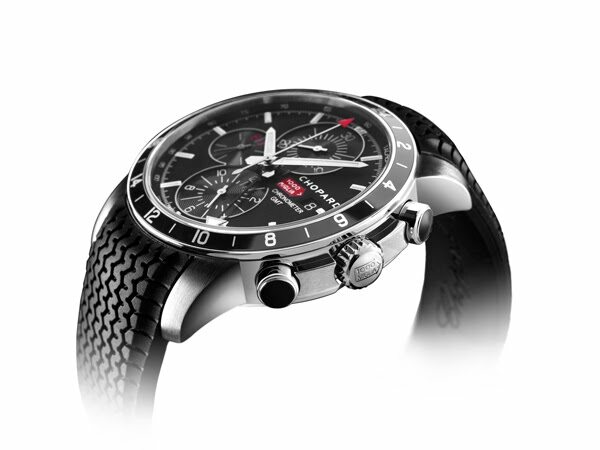 Released to celebrate the 2012 edition, the Mille Miglia GMT Chronograph provides peerless readability. The chronograph counters at 12 and 6 o’clock, inspired by the dashboard instruments of classic racing cars, are oversized to ensure extremely fast and comfortable read-off that is further enhanced by the white hour-marker standing out clearly against the black dial. The central sweep seconds hand is tipped with the collection’s signature red arrow. The mechanical self-winding movement, chronometer-certified by the COSC and equipped with a stop seconds function to ensure highly accurate time-setting, also drives a useful and user-friendly dual time-zone display. A second hour hand, tipped with a white arrow, points to the 24-hour GMT indication around the black bezel forming an authentic visual extension of the dial. This exceptional watch also shows the hours, minutes, small seconds at 9 o’clock and the date through a window at 3 o’clock. Available in steel or rose gold in two editions respectively limited to 2,012 and 250, this 42.4 mm-diameter timepiece features a satin-brushed crown guard, as well as the iconic natural rubber Dunlop Racing strap bearing the famous 1960s racing tyre-tread motif. The technical, sporty case of this new Mille Miglia GMT Chronograph is water-resistant to 50 metres, while its closed and circular-grained and bears the emblematic “1000 Miglia” arrow as well as a nameplate designed to carry the limited-edition inscriptions.